The Official Foodies In NYC: A Special Foodies In NYC Round Up! A Special Foodies In NYC Round Up! This was a special Foodies in NYC. We decided to do TAKE OUT and take a trip down memory lane of food clubs past (and pre-Foodies In NYC blog!). So we ordered in some Turkish food from Marmara on the Upper East side. While snacking on some Manit (steamed dumplings with lamb and herbs...think the Turkish form of gnocchi), hummus, artichokes and Turkish meatballs, we came up with a a VERY random list of what we suggest to EAT or NOT TO EAT! We also decided to start a rating system! Five forks - MUST GO; One fork - Take a permanent RAIN CHECK! Barbes - None of us had tried Moroccan food before so this was a little adventurous to us at the time - but it was great! Nothing scary on the menu and the dishes were very sharable. Plus - the authentic Moroccan white wine was great! We give it 3 forks! Mercat - Amamos Tapas (we love tapas!) The plates were little and we tried a lot (8 plates!) We topped the meal off with homemade churros and left very full and happy! We give it 4 forks! Graffiti - This strange little eclectic restaurant/shack was a surprise. All of the food is pre-prepped and cooked on hotplates in a closet-sized kitchen (the whole place is maybe 5 tables). We ate things like tofu, pork buns and pepper ice cream! And it was all fabulous! 3.5 forks! Yakitori Torys - Danielle and Christa LOVED it - Anne HATED it. Chicken neck and/or skin may be an acquired taste - but definitely try this place for traditional yakitori. NOTE - the rest of Manhattan apparently agrees with Anne ;) Yakitori Tory actually closed this summer - but many on Yelp offer up Yakitori Trotto as a great alternative. Overall - Danielle and Christa give this 3.5 forks! Freemans - Great if you can get in and/or find it. It was so good - we wrote down everything we ate! Spinach artichoke dip (DD's favorite! ), fried chicken and pork chops are a must and we dove into desserts with a brownie, cheery tumbler and a blueberry cobbler - oh my! 4.5 forks indeed! The Spotted Pig - This was where the idea for our blog first percolated! We waited for over an hour to sit (on a weeknight) - but it was well worth it. We had a friendly waiter who seeded the idea for us to write about our experience. It's a British inspired bistro with some Italian influence. The burgers, deviled eggs, shoe string fries and chicken liver pate made it worth the wait. PLUS - we just found out that this is owned by none other than Shawn Carter - aka JAY-Z! We give it 4 forks! So, when we select our restaurants, we do our research. We want good food, good drink and good atmosphere - so it really is rare that we have a "less than good" experience. But after 3 years, we accumulated a small list of "meh" places. Woo Chon - Korean BBQ. Christa and Anne overrode Danielle on this. It was a little too "authentic" for our taste. We had to grill our own food -- (um - that's why we go out - so we don't HAVE to cook our food - DUH)! Great Jones Cafe - Some will be surprised to hear this - but it just wasn't up to par. Good bevvies but average food. 2 forks. So there you have it! 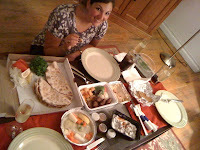 Some of our most memorable meals - here is to many more!